Blooms galore! Fiery pink Spray Roses are combined with clusters of white and green Peacock to make this gorgeous, top value bouquet. Spray Roses are great value with many blooming buds per stem. Surprise someone today with this explosion of colour.The vase pictured is not included, however to upgrade your gift, you can choose between 3 vases; Standard, Premium and Superior. We recommend a Premium Vase for these Fiery Pink Spray Roses. My order was for flowers for a 1pm funeral. At 7.02 am on 4th I received an email saying that the supplier advised that the order was delivered and that I could track it. 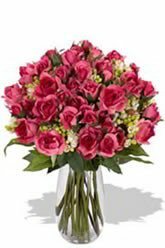 Tracking told me that the order would be delivered between 1pm and 3pm.Neither before 7am or after 1pm would have been appropriate .I rang zFlowers.com and was told it would be investigated and I would receive an email. I did not. Guests at the funeral did not see my pink roses. Could you please tell me that they were delivered when the church was open and BEFORE the service began.